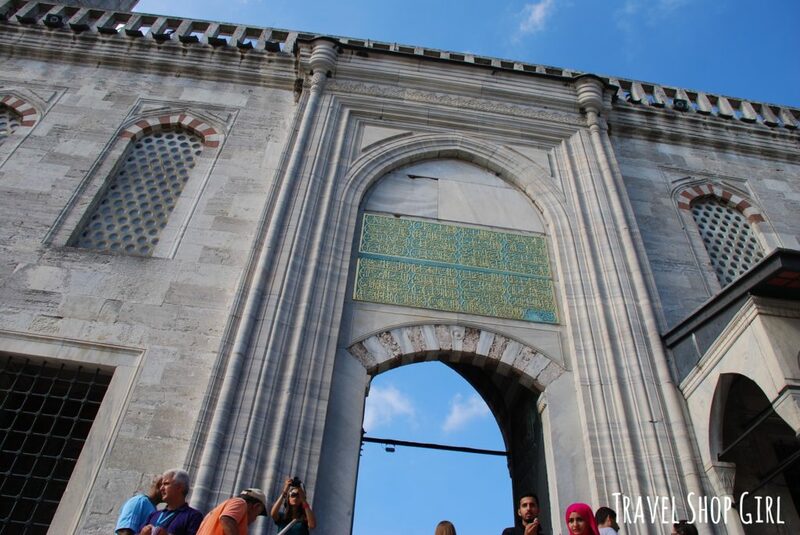 While on a cruise in the Mediterranean, I visited Istanbul on a hot August day. 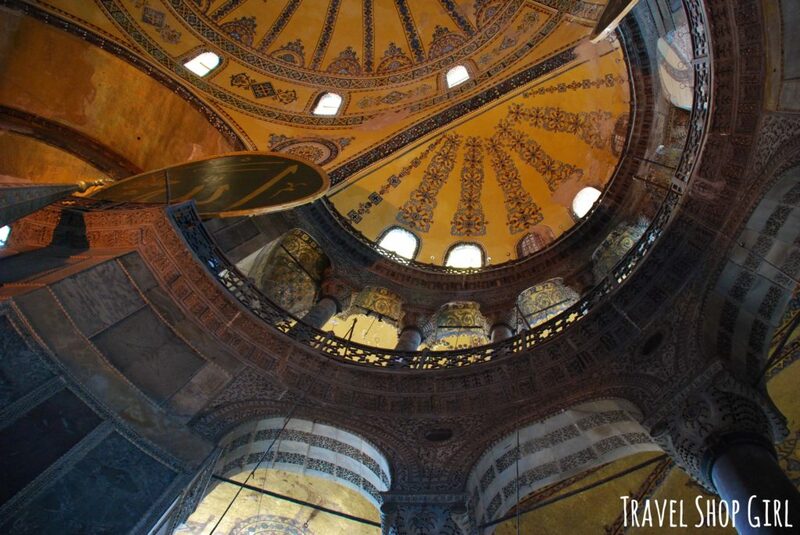 Here are some of my best Istanbul sightseeing tips when you’re short on time. After all, I was only going to be here for the day so I had to squeeze everything in. 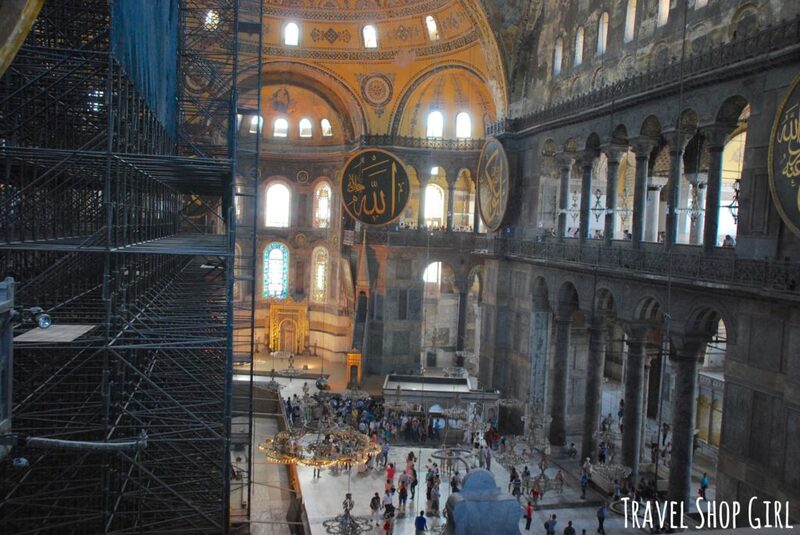 Here’s what I got to see while in Istanbul. Skip grabbing a cab or hiring a private driver while in Istanbul. 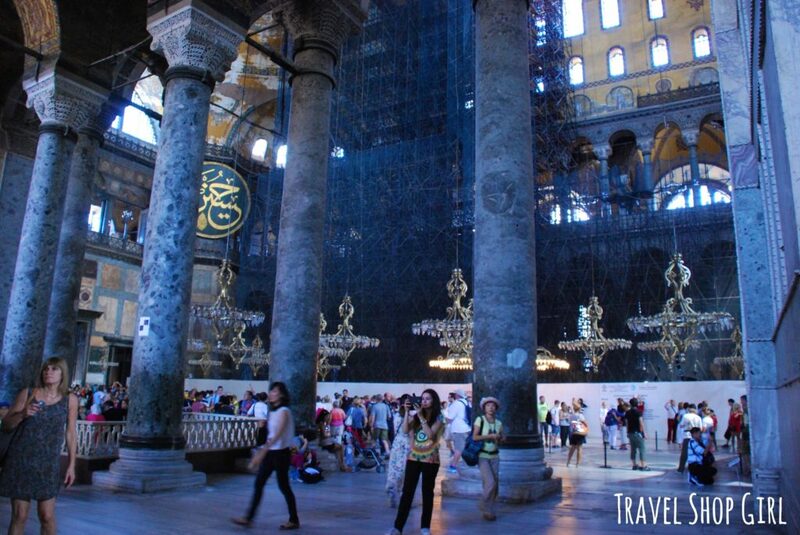 Getting around for a little Istanbul sightseeing is super easy. We took the tramway, which was definitely not difficult to navigate or understand. Tourists can save money by purchasing an Istanbul Kart. 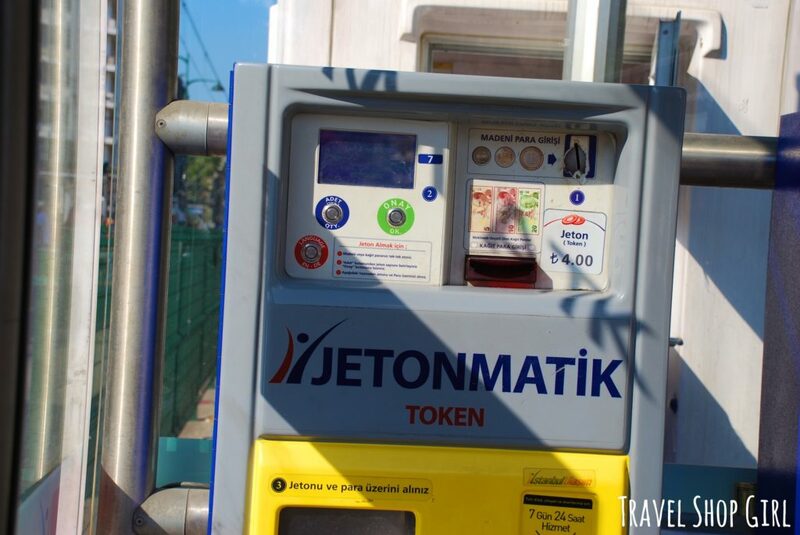 But if you’re visiting for the day without access to the card, simply insert coins in the Jetonmatik for tokens. Instructions are in Turkish, English, and German. When I visited, tokens were 4 Turkish Lira (TL) each or about $1 USD. 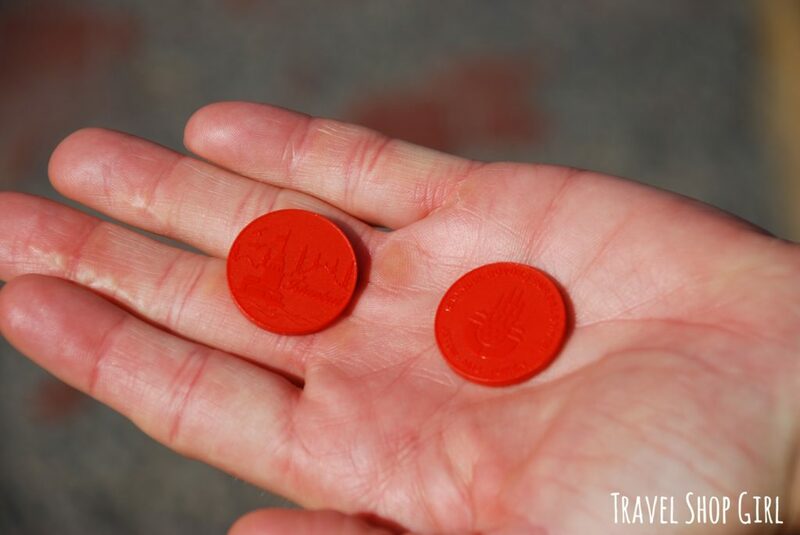 The tramway tokens are bright-colored plastic coins and are definitely one of a kind. Follow the signage to first get on the tram going in the right direction and then make a note on where you need to get off. 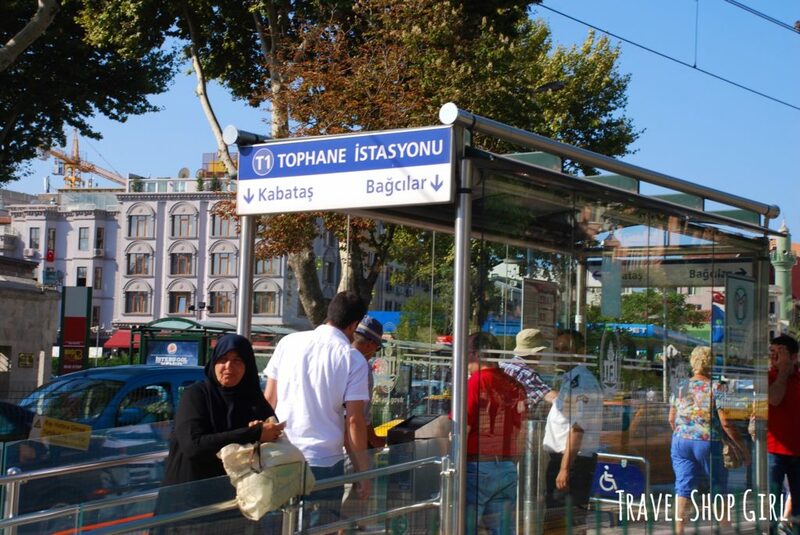 I boarded at Tophane, which was relatively close to where the cruise ship was docked. 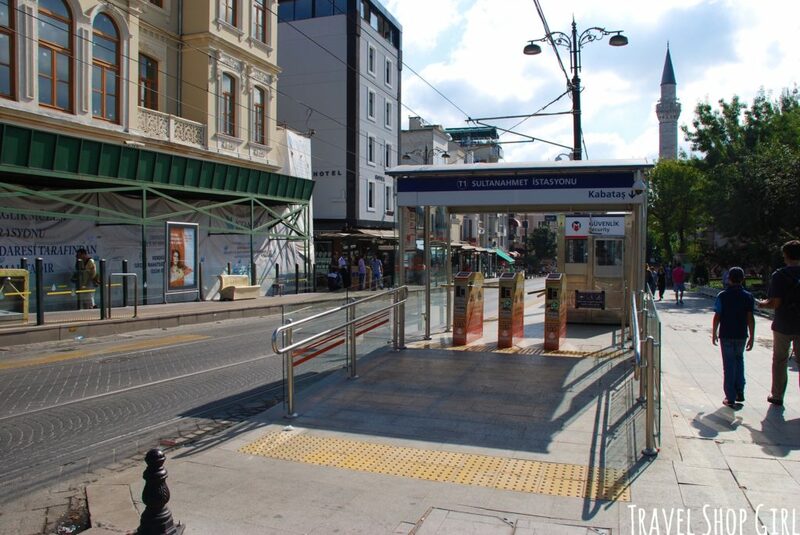 It was only a few stops to Sultanahmet, the closest station to all the Istanbul sightseeing I wanted for the day. 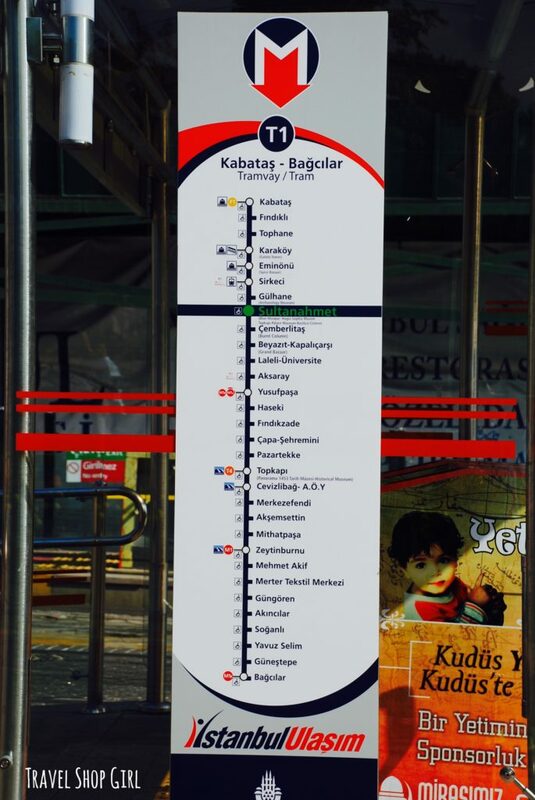 So you know, “Istasyonu” means “station” in Turkish. If you only have a few hours for sightseeing, then this is where you can step off and see a few all in one area. TSG Tip: I often take a pic of the starting and end points with my phone so if I don’t remember, I at least have a picture to remind me. If you’re up for longer travels, did you know that you can take a train from Bucharest to Istanbul? 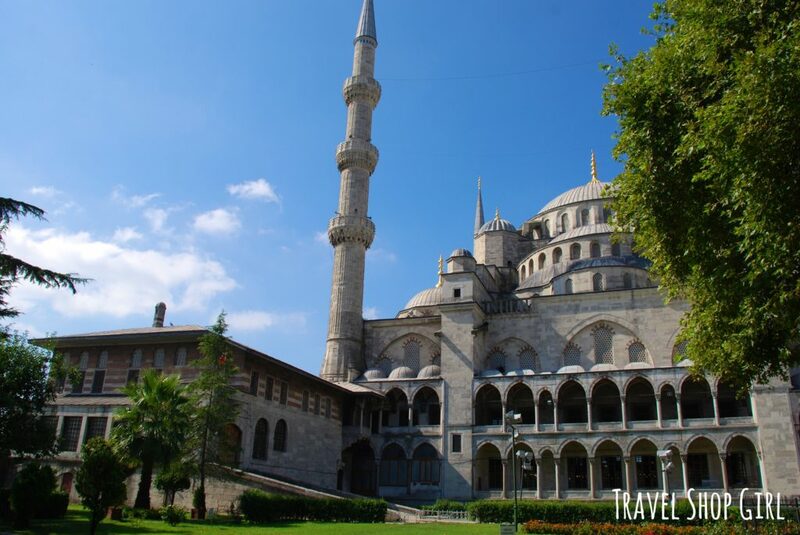 The Sultan Ahmed Mosque or Sultan Ahmet Mosque, more commonly referred to as the Blue Mosque, is a stunning historic mosque in Istanbul. 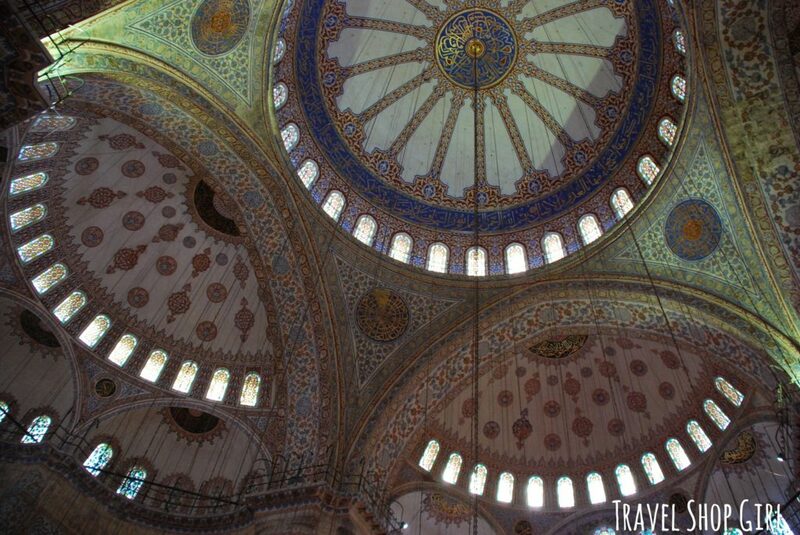 Built between 1609 and 1616, the hand painted blue tiles along the interior walls is how it earned its name as the Blue Mosque. 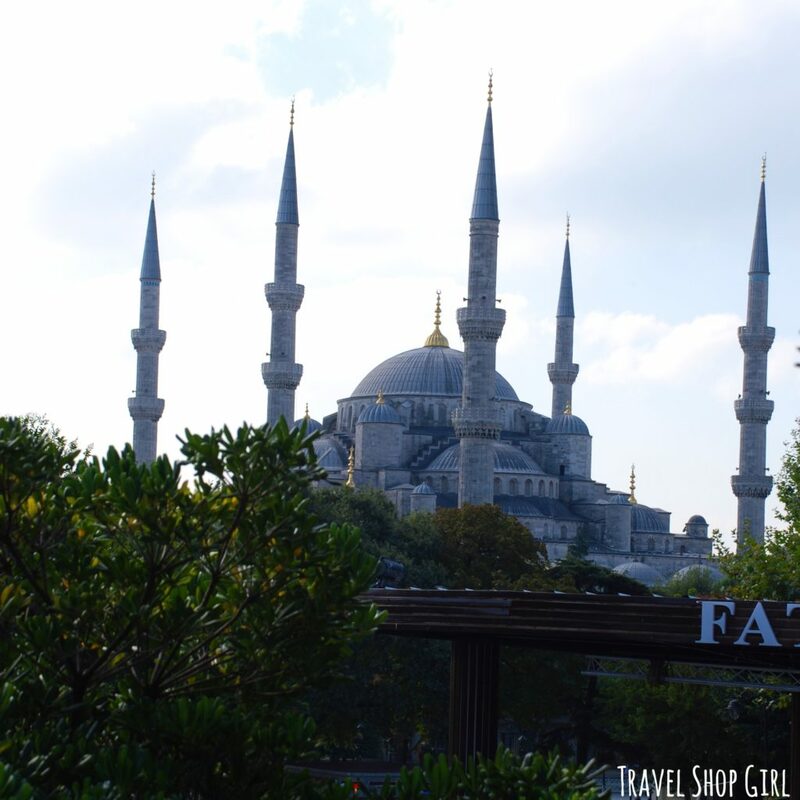 The Blue Mosque has six minarets that are 210 feet tall each, can hold up to 10,000 people, and the dome is 141 feet tall on the outside and 77 feet tall on the inside. 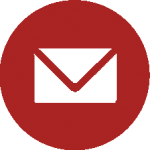 TSG Tip: What is the importance of the minaret? The minaret provides a visual cue to the Muslim community for when adhan, or the call to prayer is made. Only the Great Mosque of Mecca had six minarets until the Blue Mosque was constructed. When we arrived there were lines wrapping around the entire facility. I never thought I’d get inside. Keep in mind that almost anywhere you visit, there will always be someone trying to make a quick buck. Someone approached Mr. TSG and I inviting us to take a tour. Mr. TSG was absolutely against it knowing this was most likely some sort of scam. I was honest and said right up front that I wasn’t going to buy anything from him afterwards, that he needed to know that, and that I wasn’t going to change my mind. 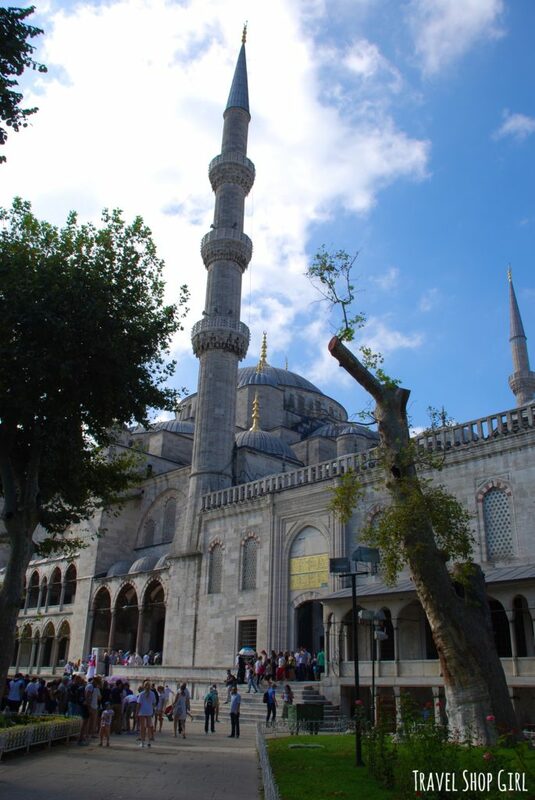 He nodded his head in agreement and took us past the long line and inside the Blue Mosque. You have to remove your shoes before entering the Blue Mosque. There isn’t an admission fee to enter, despite what someone might tell you when you arrive. Women are required to wear a head covering, which is provided free of charge at the entrance. Women should cover their heads, shoulders, bare arms, and legs. Men should cover their legs. No flash photography is allowed inside. While many people stand to one side, observe, and look around, I say look up. Give your eyes a treat and take in the beauty of the hand painted tiles. 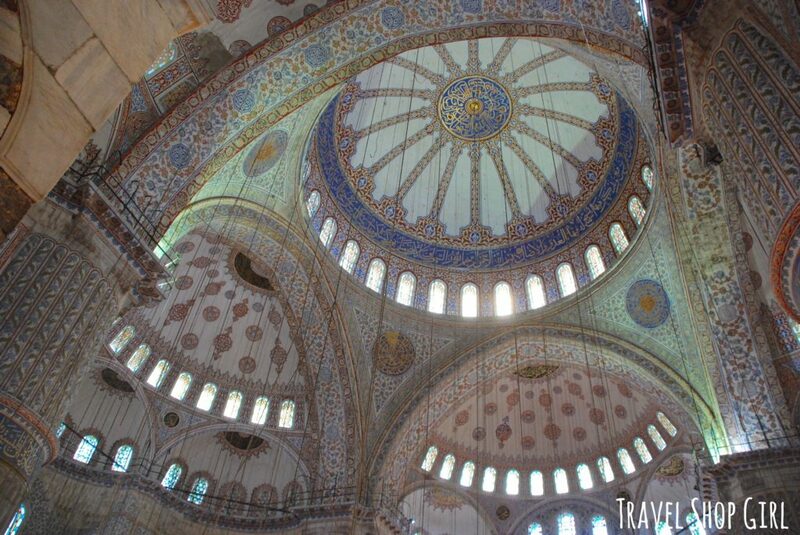 After all, the stunning blue tiles that adorn the inside of the Blue Mosque is what makes this place like no other. Our “guide” was helpful, offering information and explaining information about the Blue Mosque, but again I had zero desire to buy anything. After exiting and collecting our shoes, he was all about taking us to the shop to purchase a rug. Apparently, this must be what every tourist to Istanbul wants to do, but since I didn’t, I reminded him again that I had no intention of buying anything. We followed him to the shop, looked around, thanked him, and left. Mr. TSG felt embarrassed, that somehow we insulted or hurt this man and wasted his time. But had I not been completely honest with him? If said to him that I was going to buy something and didn’t, then I’d feel guilty. Sometimes the scammer needs a reminder that not every tourist is a dummy. This isn’t unique to Istanbul and certainly not a reflection of the wonderful Turkish people. I have encountered some version of this nearly every place I’ve visited, which is why I generally don’t speak to anyone. 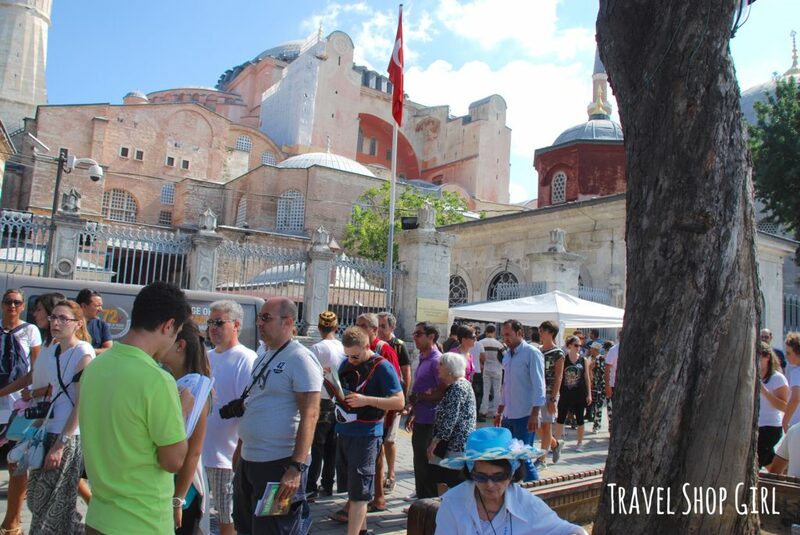 From here it’s a less than 10-minute walk onto the next popular stop while in Istanbul sightseeing: The Hagia Sophia. 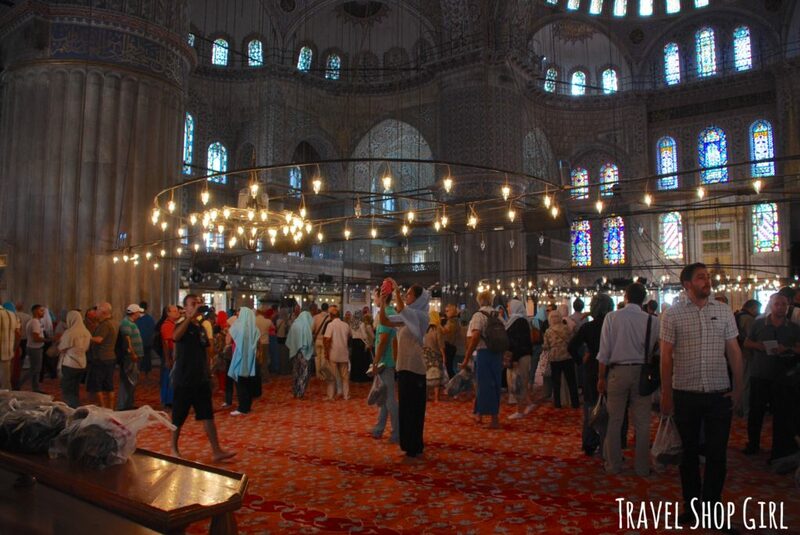 The Blue Mosque is a working mosque and is closed to tourists during hours of prayer. Hours are from 8:30 am until 1 hour before dusk daily. 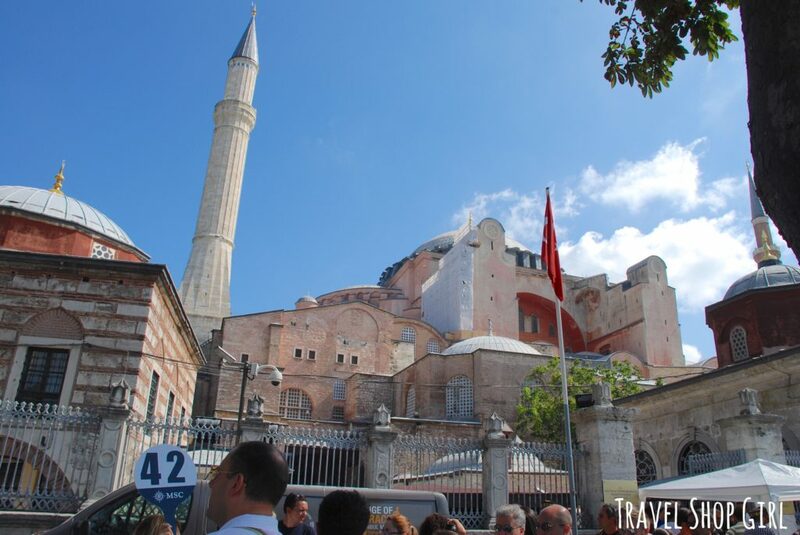 The next stop while in Istanbul sightseeing was the Hagia Sophia. 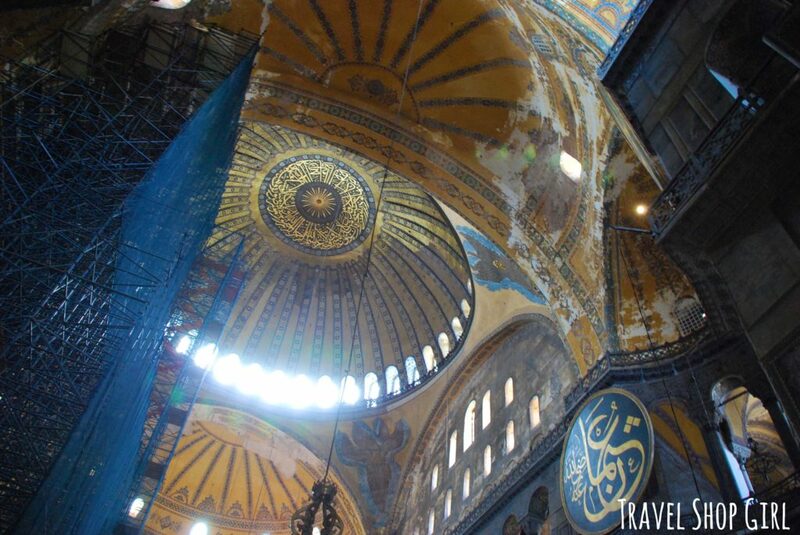 It was once a Greek Orthodox Christian patriarchal basilica and then an imperial mosque. Today it now serves as a museum as the Ayasofya Müzesi. 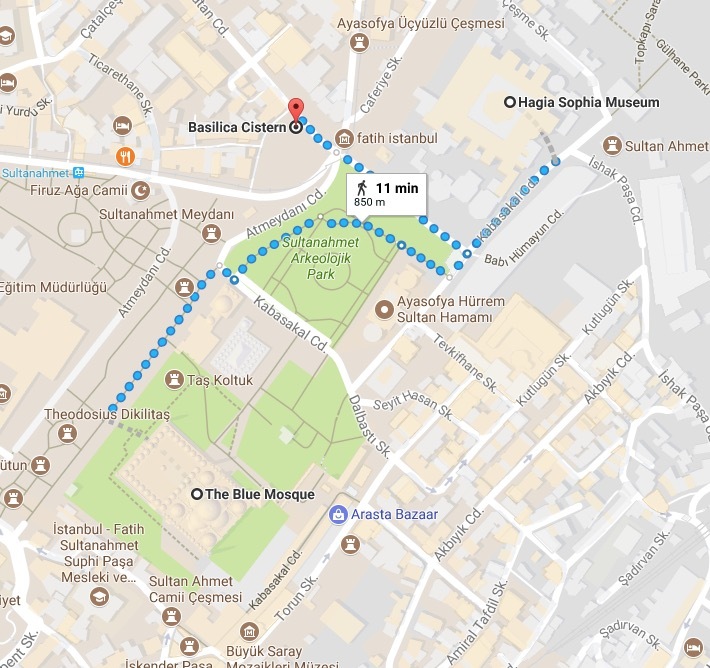 Purchase a Museum Pass Istanbul for 85 TL ($21.45 USD), which includes admission for five (5) days to the following: Hagia Sophia Museum, Topkapı Palace Museum and *Harem Apartments, İstanbul Archaeological Museums, İstanbul Mosaic Museum, **Museum of Turkish and İslamic Arts, Museum for the History of Science and Technology in Islam, Chora Museum, Galata Mevlevi House Museum, Yıldız Palace, Rumeli Hisar Museum, Fethiye Museum. So you want to save $10? While you might save money, you’ll end up in long lines waiting. Don’t believe me? More importantly, you get to skip the queue, which in my book is extremely important as time is money. 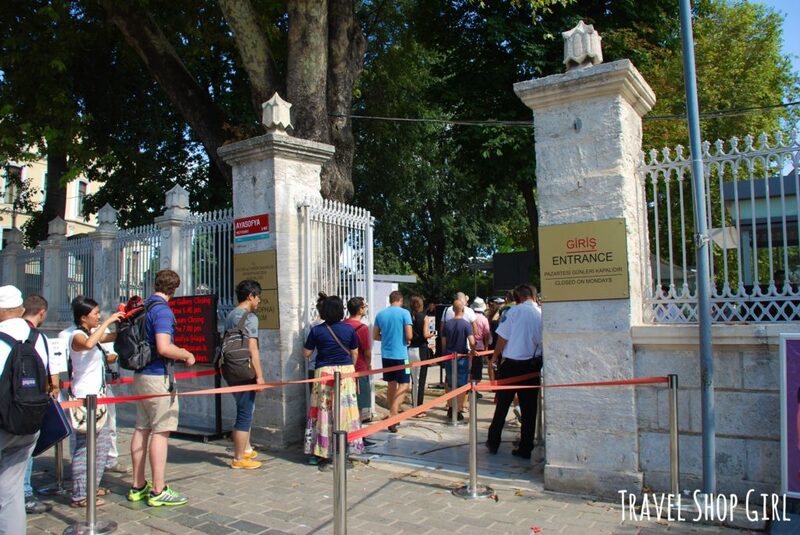 Just buy the Museum Pass Istanbul so you can skip the lines and see the sights already. 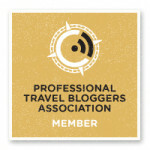 Try to purchase your pass online in advance of your trip. 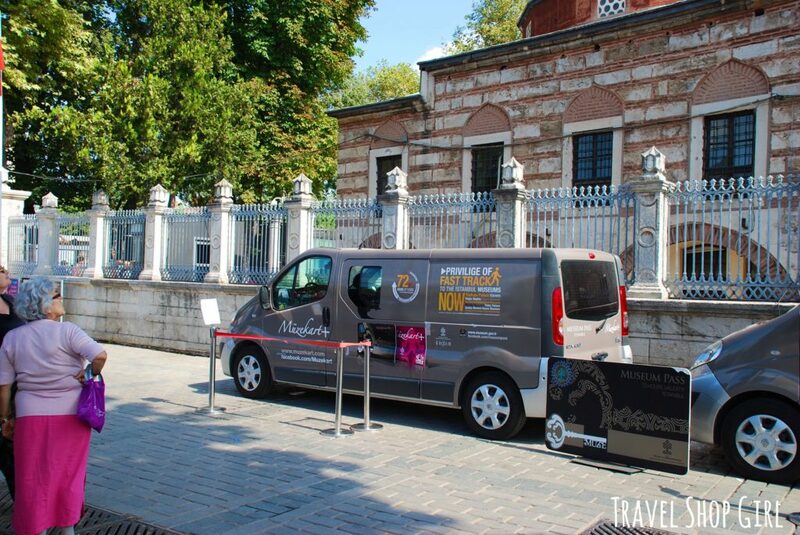 Otherwise, look for the van parked nearby the Hagia Sophia or elsewhere in this area. Once inside you can walk around on your own and take in this magnificent piece of architecture. It wouldn’t be me if I didn’t spend most of my time looking up in awe at the dome and artwork that adorns the walls. I highly recommend walking up to the Upper Gallery and peering down at the floor below. Nothing makes you feel so small and insignificant like standing inside a building of this size. 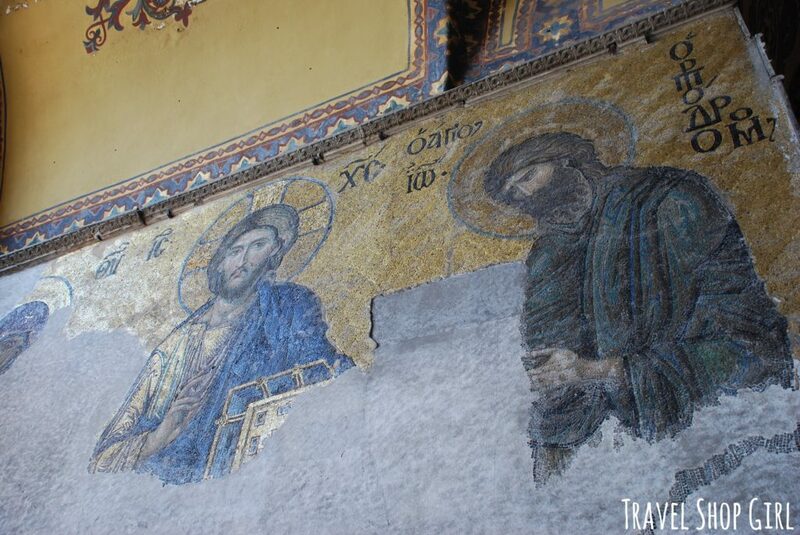 In the Upper Gallery are several mosaic panels dating back as far as the 10th century. I’ve said this many times before, but let me reiterate it again here. While I may not be a church going individual, I do love houses of worship and always seem to end up inside at least one on my travels. 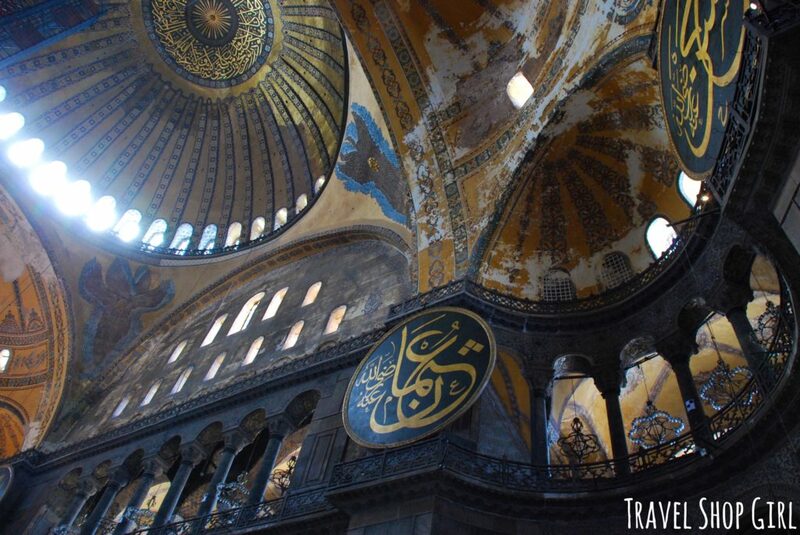 There’s so much history to discover and art that documents and details a place of worship and that’s true of the Hagia Sophia. 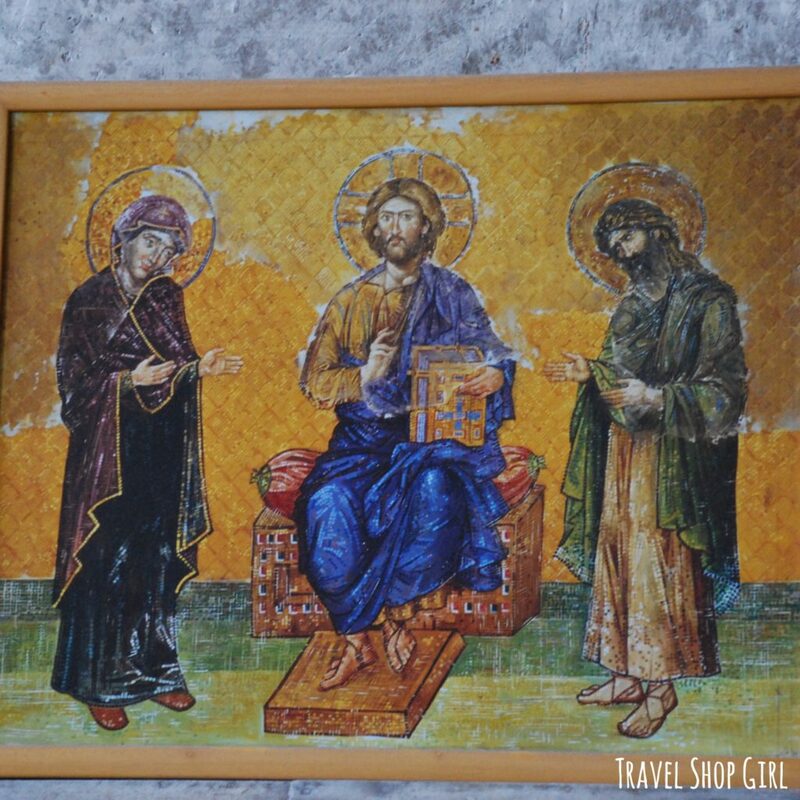 The Hagia Sophia Museum is open every day but Mondays. 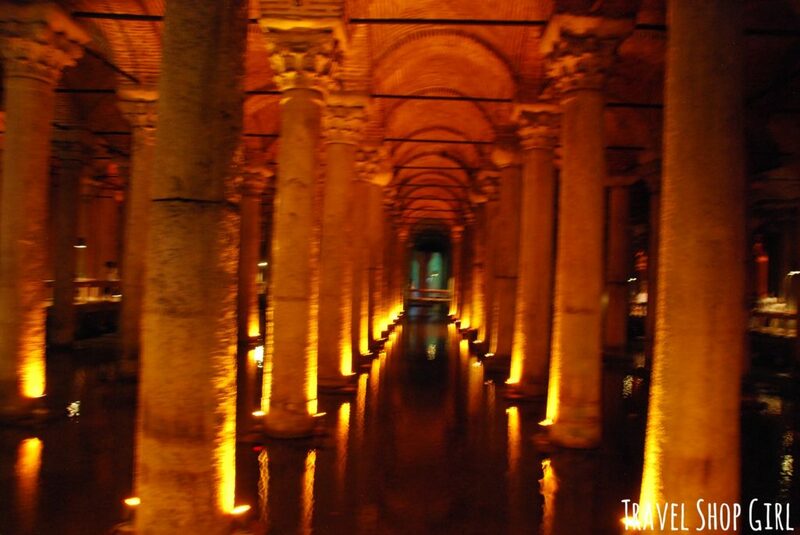 It also didn’t hurt that it was August, I was sweating profusely, and the Basilica Cistern was underground. 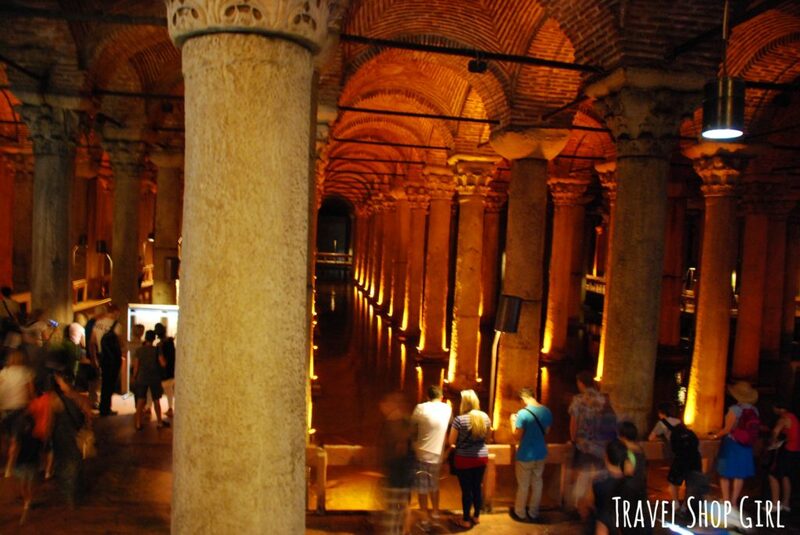 Wanting to cool off, making a visit underground while in Istanbul sounded perfect. 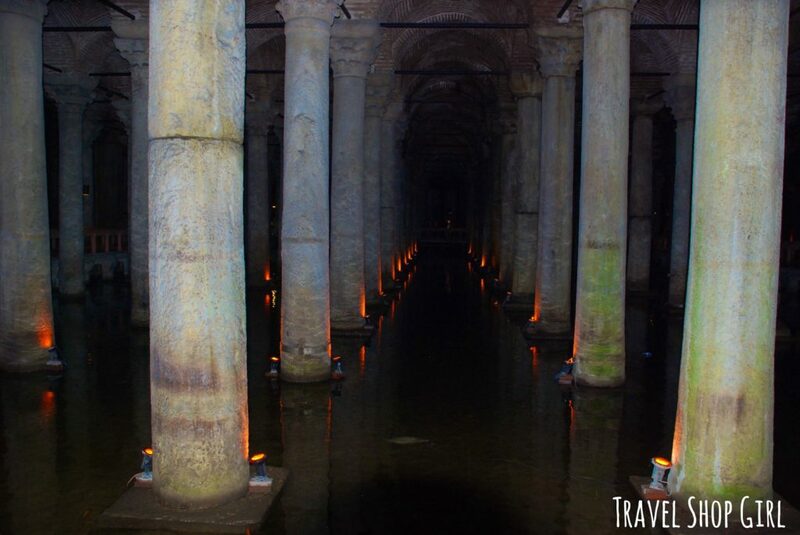 Built in the 6th century, the cistern was a water filtration system for the Great Palace of Constantinople. 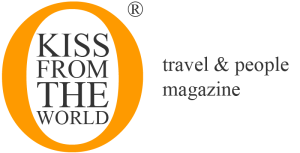 Today it’s a tourist destination that attracts numerous visitors each year. While it’s currently under renovation, visitors may still go in, but expect plenty of noise from construction and no water inside. The large chamber measures about 105,000 sq ft in area and can hold about 2,800,000 cu ft of water. The ceiling of the cistern is supported by 336 marble columns, each 30 ft high, arranged in 12 rows of 28 columns each spaced 16 ft apart. Two Heads of Medusa, which are used as the bases of two columns, are examples of Roman period sculpting. Some speculate that the blocks were placed sideways and inverted in order to negate the power of the Gorgons’ gaze, but there’s no evidence or proof of this whatsoever. It was difficult taking photos inside because it was quite dark. However, although I didn’t get a clear pic, I did do one very touristy thing while there. 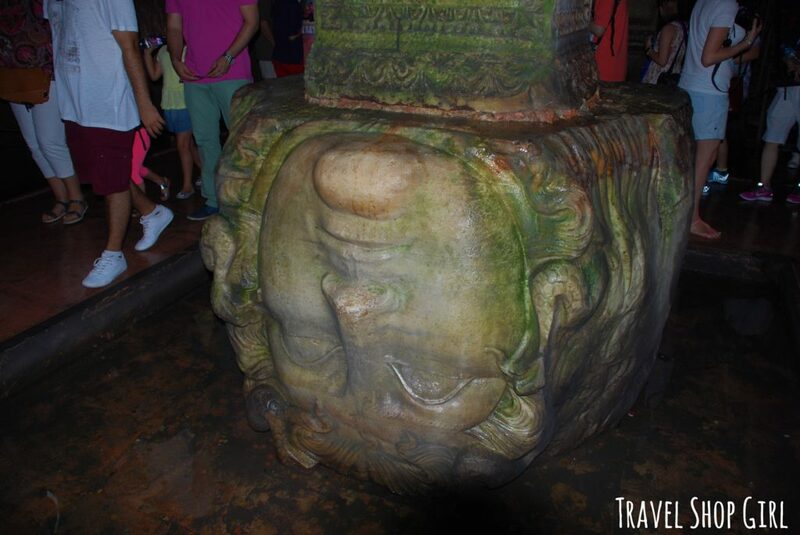 Simply stick your thumb inside the hole of the weeping column, make a wish, and then rotate your hand 180 degrees. You’ll see people lining up to do this so just squeeze in and participate before leaving. Some say it’s only for making a wish while others say prayers and miracles are answered here. 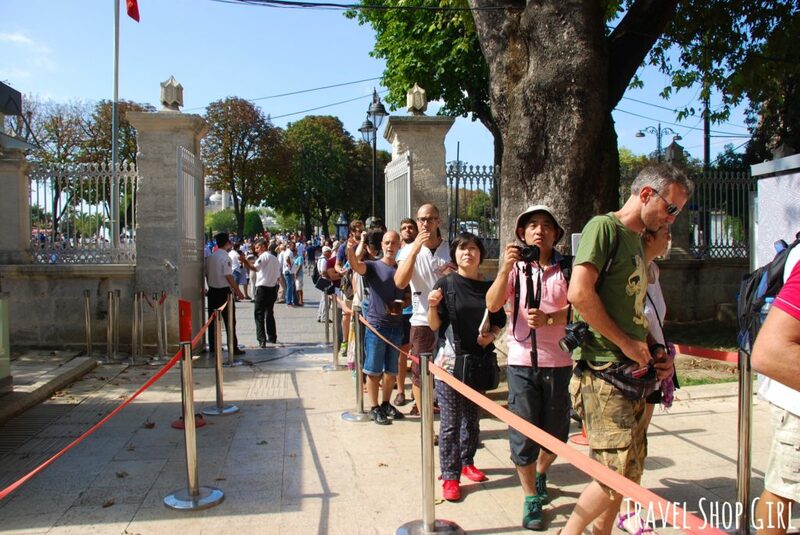 Admission is 20 TL ($5 USD) and is open every day from 9 am – 5:30 pm. 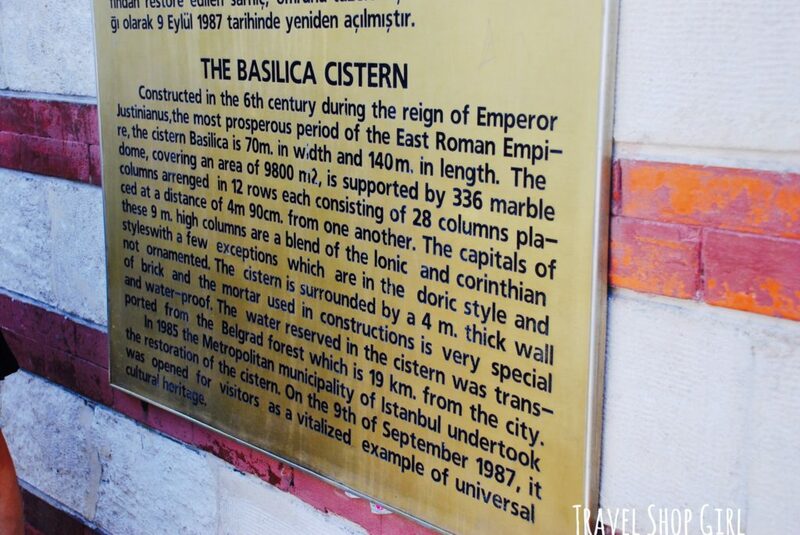 To give you a better idea of the destinations we visited while in Istanbul sightseeing, take a look at the map above. As you can see, they are all relatively close to one another. Therefore, if you stop in Istanbul on a layover to another destination or on a cruise ship, make your way into the city and explore. There’s absolutely no reason not to check out the amazing sights of the city. 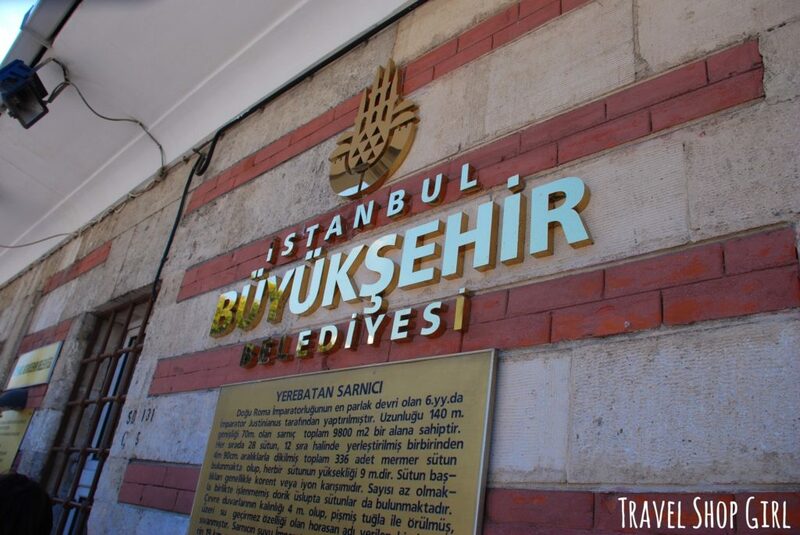 We did continue on throughout Istanbul and even spent time at Topkapi Palace, but starting here in this central area made for an easy start to the day. 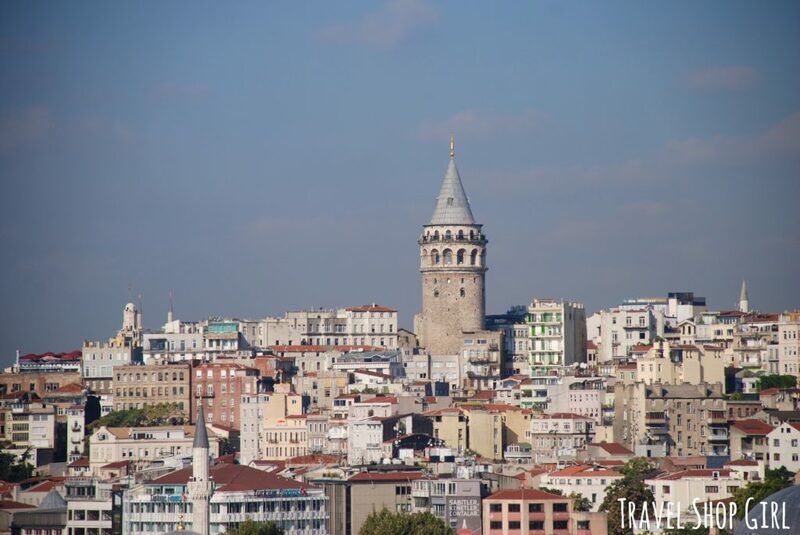 Have you spent the day in Istanbul sightseeing? 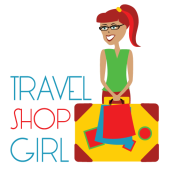 Discover some other great destinations here on the Travel Shop Girl website . On my new SPONTANEOUS TRAVEL SCALE of 1-5, with 1 being super easy and spontaneous and 5 being you better plan far in advance, spending the day in Istanbul sightseeing for a few hours definitely fits the bill of spontaneous travel. Although you definitely should check in advance that all locations are open on the day of your visit. I’m giving it a 1 and a big spontaneous travel thumbs up.